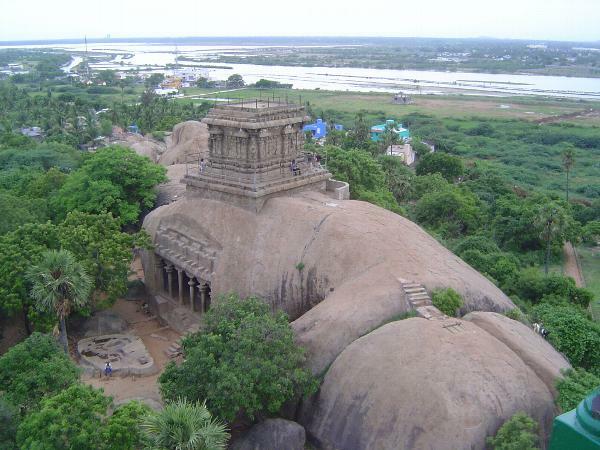 We're about 40 miles south of Chennai and at one of India's earliest and oldest tourist attractions. 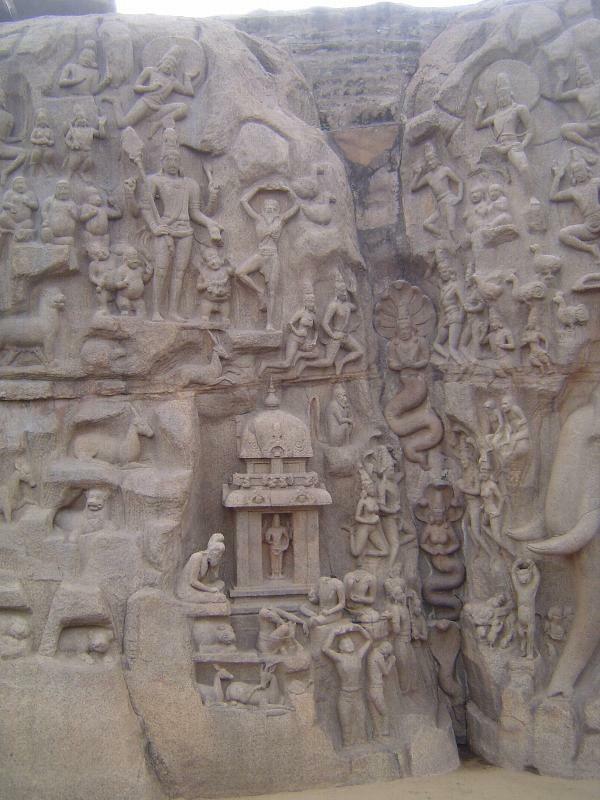 This is Mamallapuram, a condensed form of Mahamallapuram, meaning the town of Mahamalla, the "great wrestler." 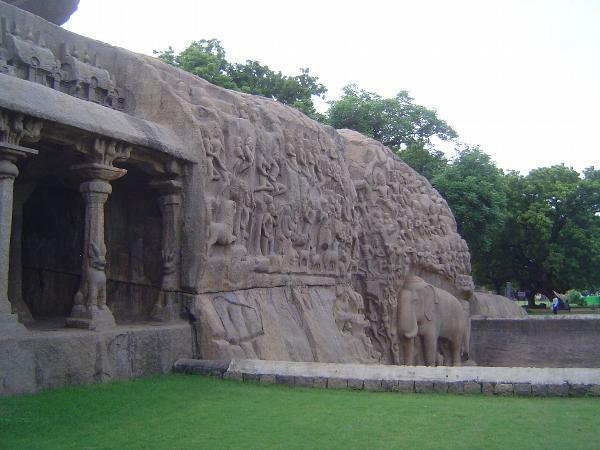 From the 16th century on, it's also been known as Mahabalipuram, the town of the great Bali. Mahamalla would not have been pleased. 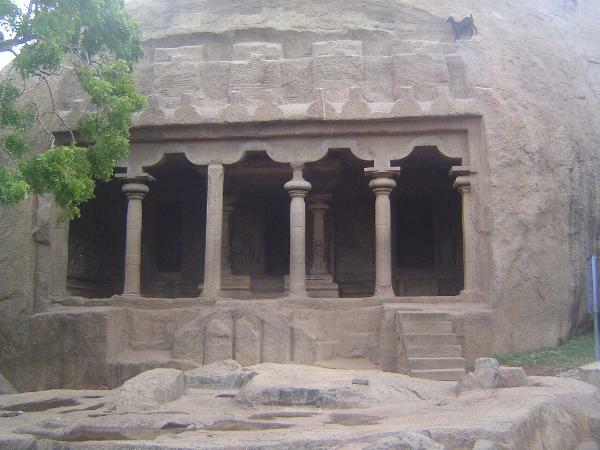 He was a seventh century Pallava monarch. 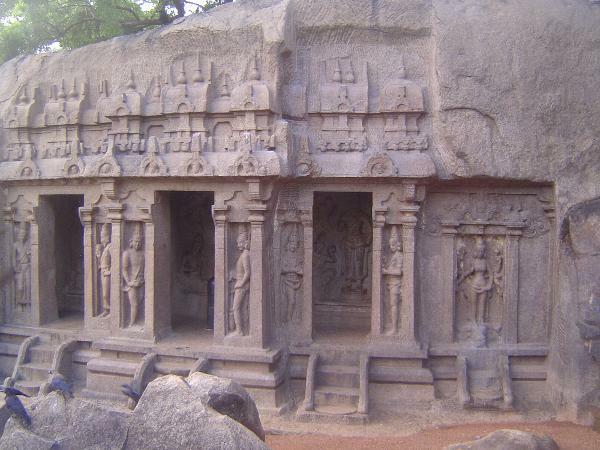 His capital was 40 miles inland at Kanchipuram. He needed a port, and this was the site he chose. No chartered helicopters for an overview, but this will do. Yes, the Victorians occasionally relaxed. 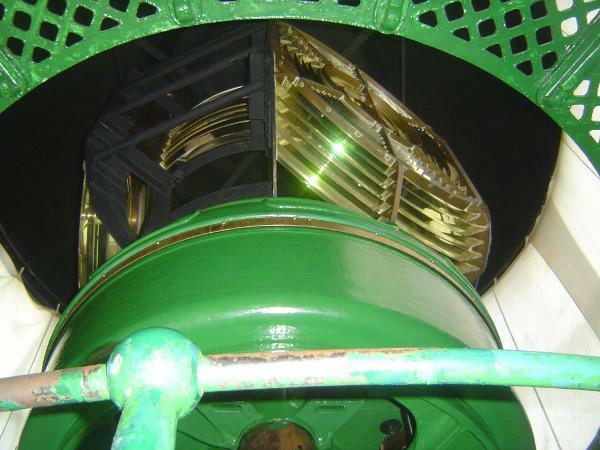 That would be a Fresnel lens, I do believe. Anyway, here's what we came to see. The view is south and slightly west, toward a lagoon. An early visitor, William Chambers, wrote of this place in 1788: "The rock, or rather hill of stone, on which great parts of these works are executed, is one of the principal marks for mariners as they approach the coast, and to them the place is known by the name of the Seven Pagodas, possibly because the summits of the rock have presented them with that idea... But, be that as it may, the appellation by which the natives distinguish it, is of a quite different origin: in their language, which is the Tamil, (improperly termed Malabar,) the place is called Mavalipuram, which, in Sanscrit, and the languages of the more northern Hindus, would be Mahabalipura, or the City of the great Bali." 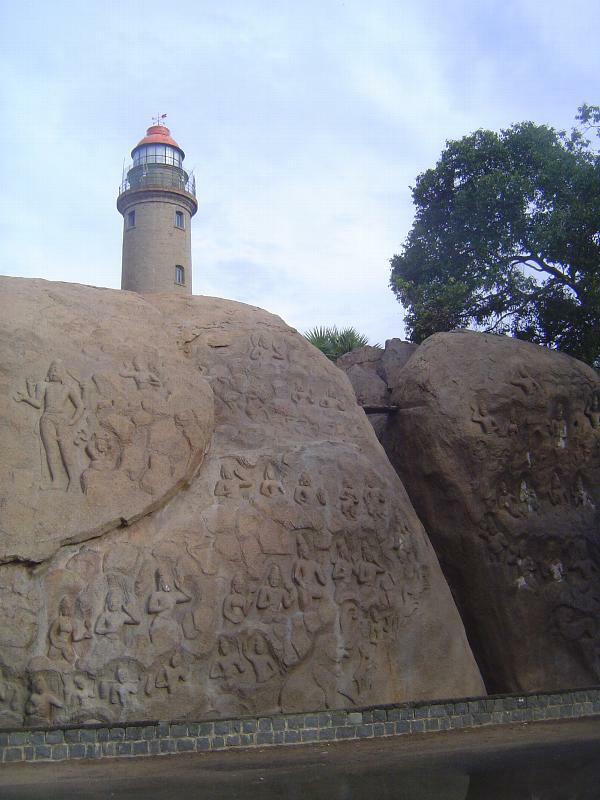 Update the spelling and you have Mamallapuram or Mahabalipuram. Late in the seventh century, and for about 40 years thereafter during the long reign of Rajasimha, the place became an artistic center. 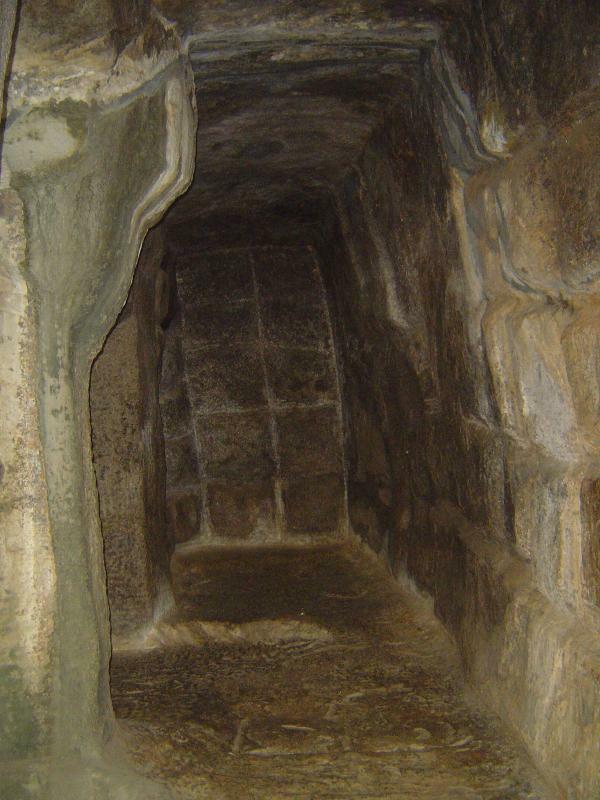 With the king's death, the craftsmen downed tools and left, which is perhaps why many of the monuments are unfinished. Here you can see the two types of temples found on the site. First, there are monolithic buildings cut from bedrock; second, there are constructed buildings of quarried stone blocks. 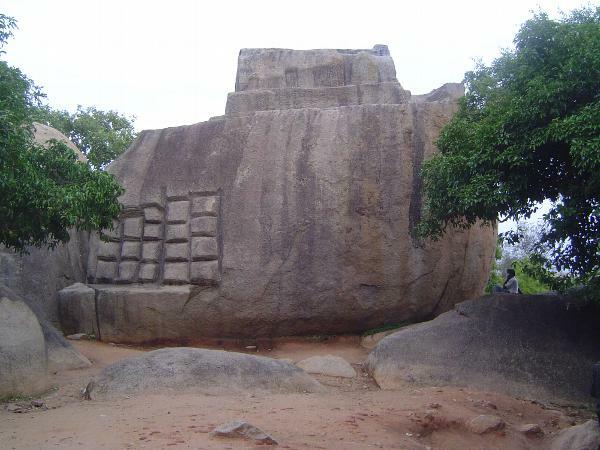 In this case, the blocks are the base of the Olakkannesvara Temple, of which only the base survives. 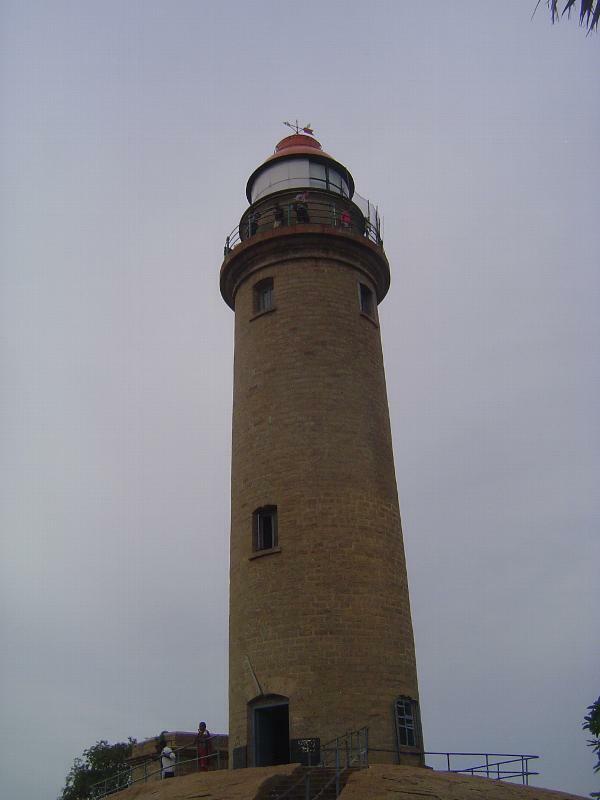 When the top disappeared is a nice question, but photographs show that the British operated a lighthouse on the top of the temple in the late 19th century. The sea is perhaps a quarter mile to the east. 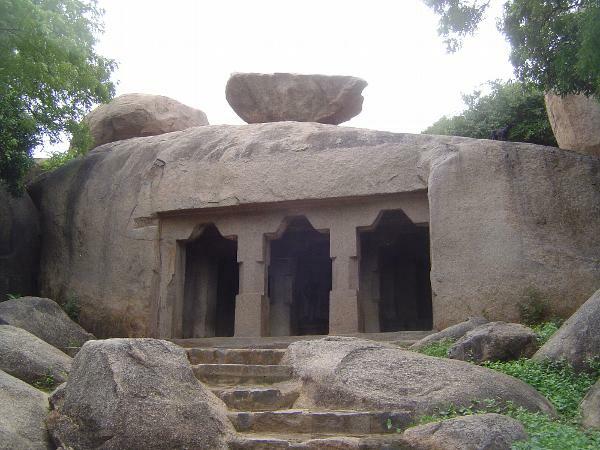 About ten monolithic temples have been scooped from the rocky ridge. 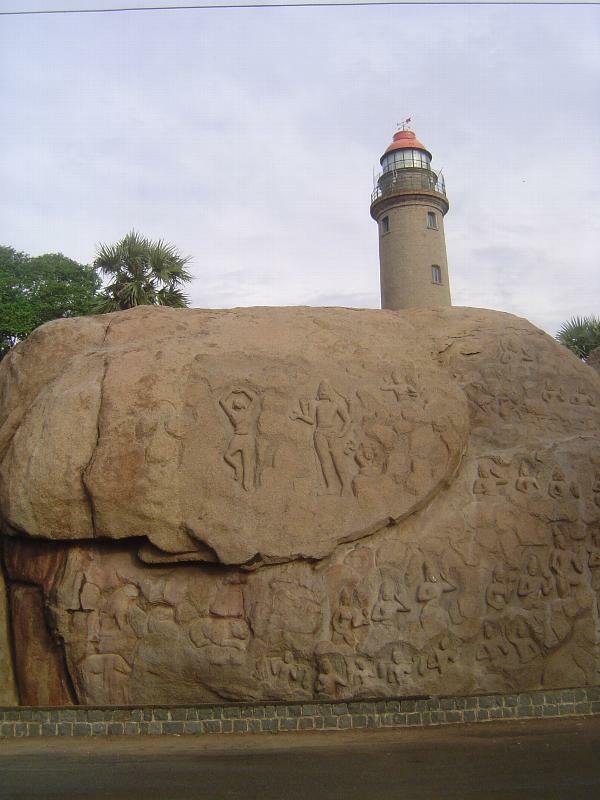 The modern town of Mamallapuram or Mahabalipuram lies to the east. 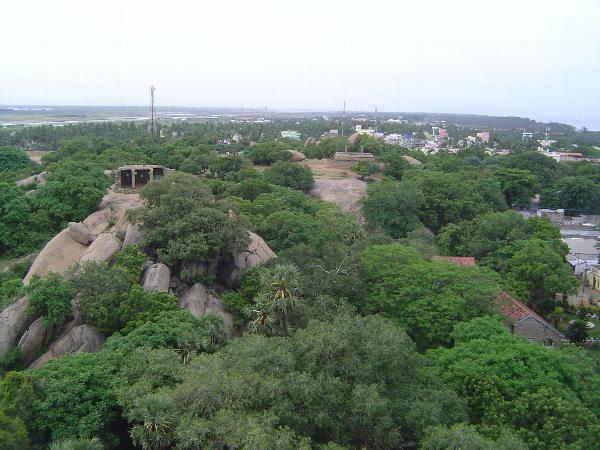 Here's the monolithic temple seen from the top of the lighthouse. It's the Mahishasuramardini Temple, or the temple of the destroyer of Mahish, the Buffalo Demon. The basic form is characteristic of almost all these scooped temples: an entrance hall or mandapa leading to one or more shrines, most of which are now empty. One column has been removed, though replaced by a crude substitute; a neighboring column has been mutilated with the apparent but abandoned intent to remove it. Here's the view from within that porch. The lion capitals are a standard device. In the background, a panel shows Vishnu in the trance during which he dreams the creation of the universe. The form has been repeated countless times in the Hindu world, although details vary. 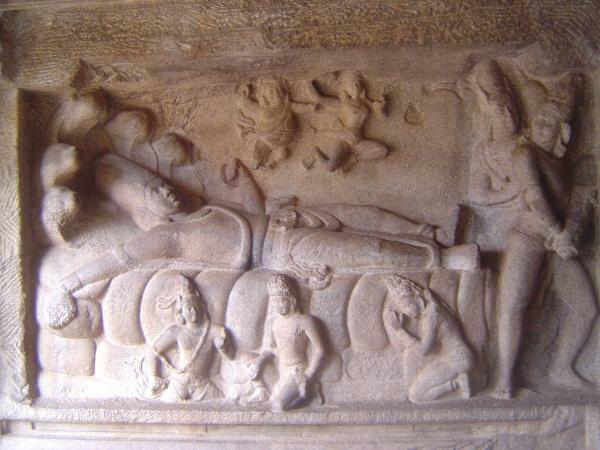 Vishnu sleeps on the great snake Ananta, whose heads curl behind his. 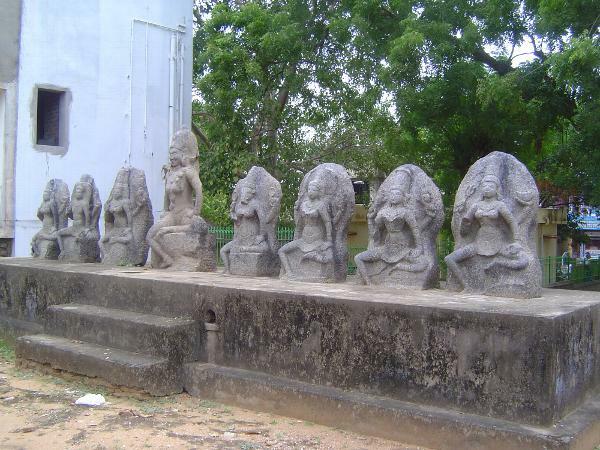 Demons, who have crept from Vishnu's ears (never can tell about such things! ), are recoiling on the right, driven by Vishnu's discus and conch, here appearing anthropomorphically to fly above Vishnu toward the demons. 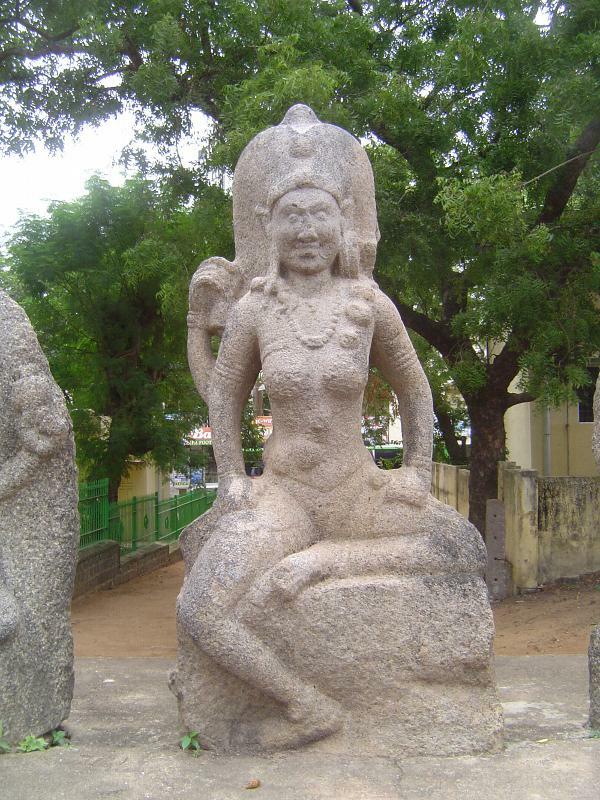 Below Vishnu's knee, the earth goddess kneels in worship. The story comes from the Markandeya Purana. The sculptures were once painted. 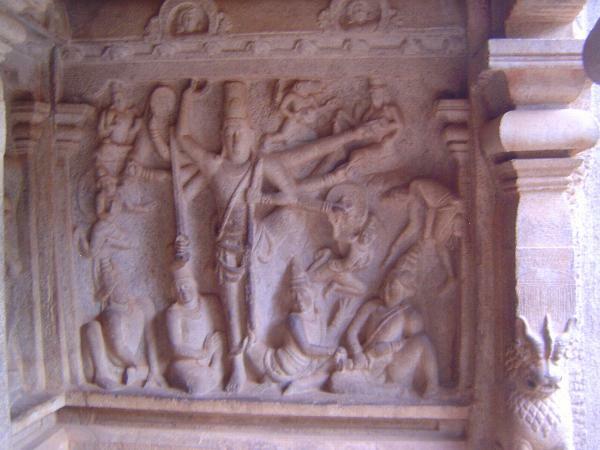 The facing panel shows Mahishasuramardina herself, alias Durga, astride her lion and about to kill the Buffalo Demon, Mahishasura. He had grown so powerful that he was acknowledged as the king of heaven. (The umbrella overhead signifies his royal power.) Neither Brahma, Vishnu, nor Shiva could get rid of him, but their combined anger created a new goddess, Durga, to whom they gave their weapons. With them, she did the job. 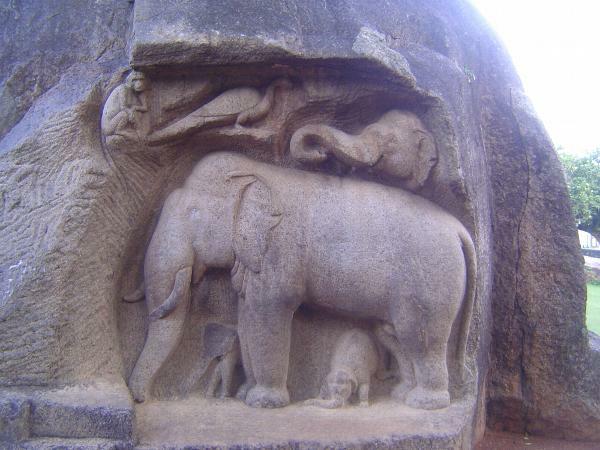 For a long time, this vivid panel has been considered one of India's most outstanding sculptural achievements. Jouveau-Dubreuil calls it "assuredly one of the best works in India." 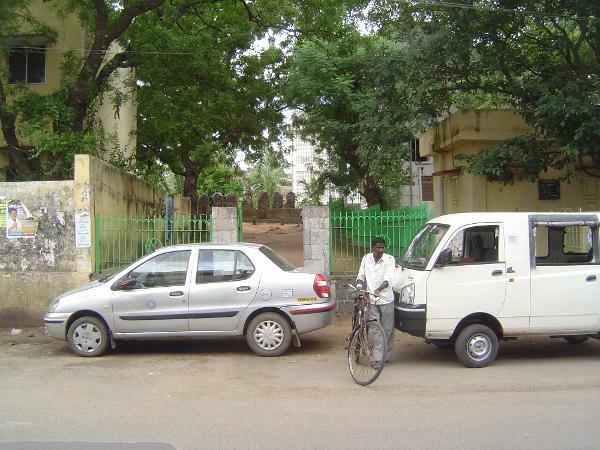 Note: Gabriel Jouveau-Dubreuil was a professor at the Pondicherry college. Of Mamallapuram in general he wrote that "the traveller who formerly took the road from Pondicherry to Madras, found on his way very strange monuments: these were not built of stones placed above one another, but were simply rocks that the sculptor's chisel had worked on, either to give them the external form of a building, or to excavate in them subterranean chambers" (Pallava Antiquities, 1916, p. 7). 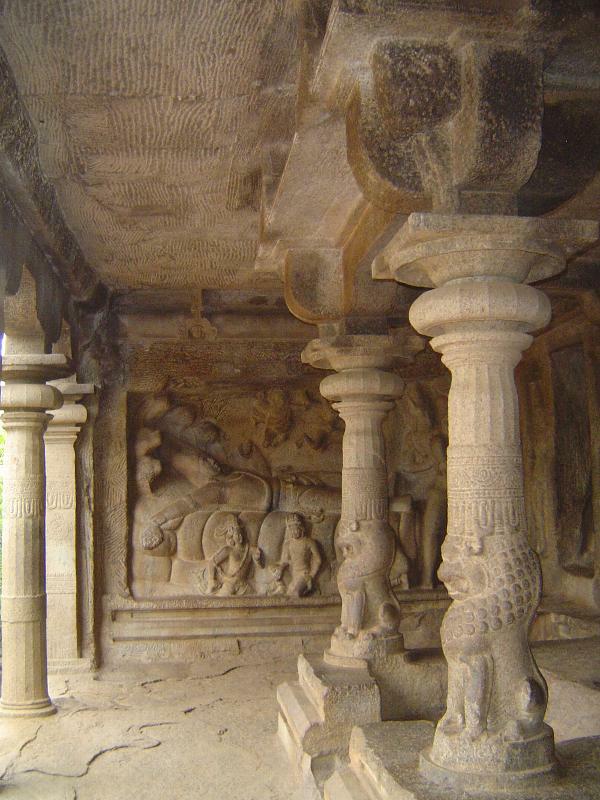 Here's another temple, named for Varaha, Vishnu's boar incarnation. 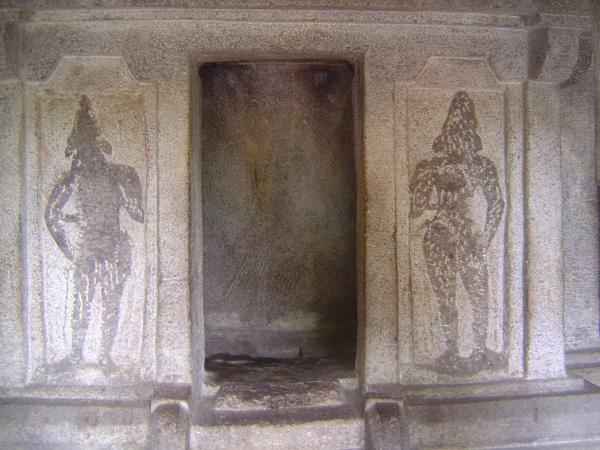 Door guardians stand on either side of the now-empty sanctum. 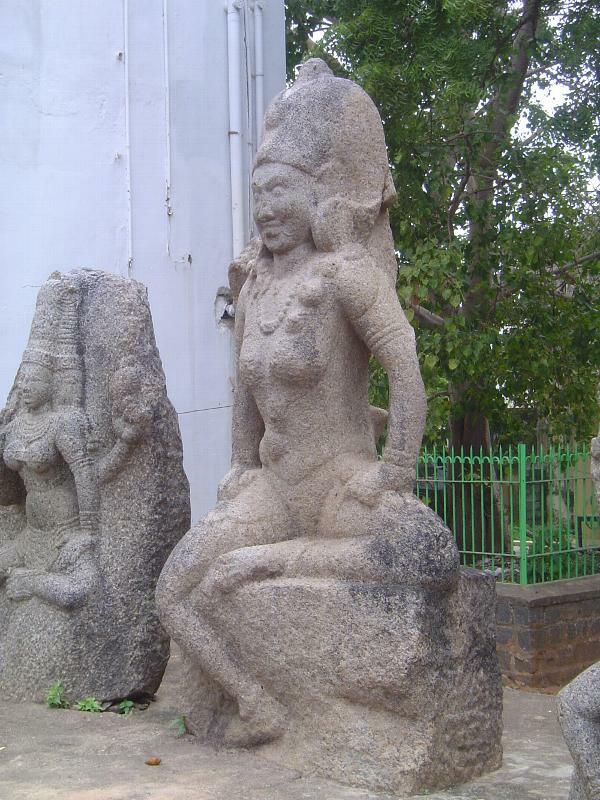 The guard on the left has a discus in her hair; the one on the right has a conch; both are symbols of Vishnu and indicate that the temple was dedicated to him. Here's the mandapa panel which gives the temple its name. Vishnu in his boar incarnation gently lifts the earth goddess from the great flood; his foot rests on Nagaraja, ruler of the deep. 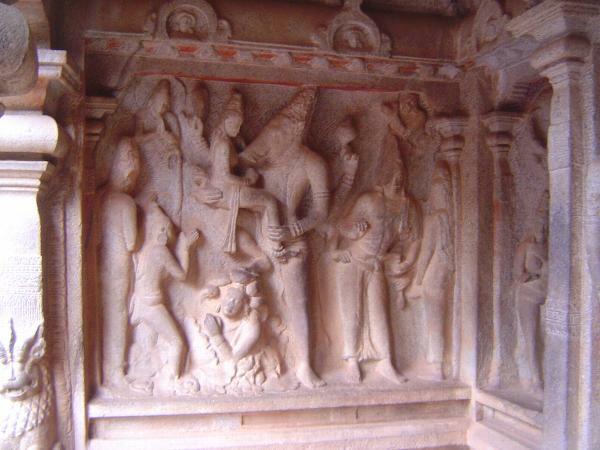 Facing the Varaha panel is one showing Vishnu as Trivikrama. 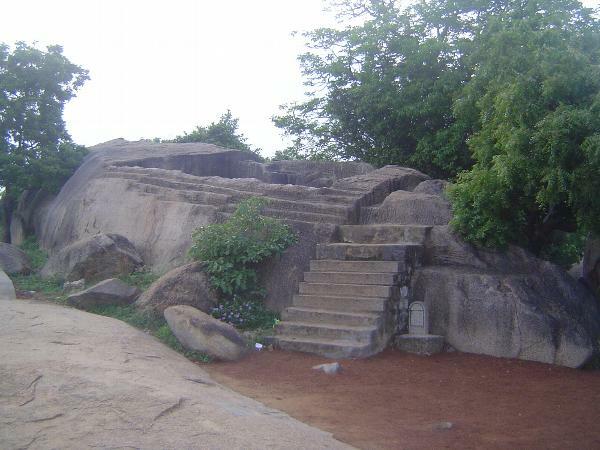 The story is that he had tricked King Bali into giving him as much land as he could cross in three steps. Vishnu then grew huge and in three steps crossed the earth, heaven, and the underworld. At the moment shown, he is stretching before stepping over heaven. 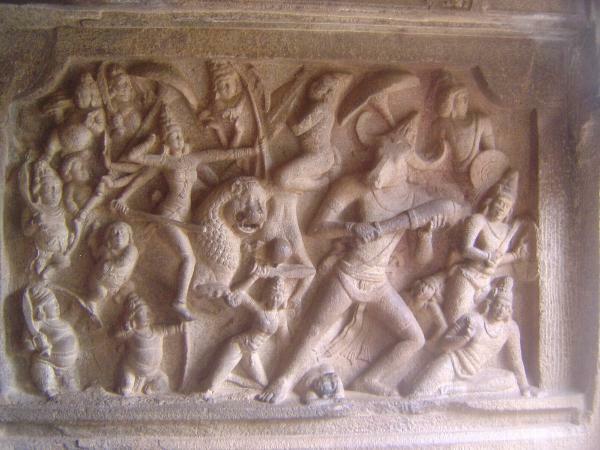 King Bali, losing his kingdom, is being hurled to the underworld. Brahma pours water on Vishnu's uplifted foot to initiate the flow of the Ganges. On a panel facing outwards, Durga is worshipped by a devotee so devoted to her that he is about to cut off his own head. The more sensible devotee on the right settles for a gift of flowers. The lion and antelope are associated with Durga. 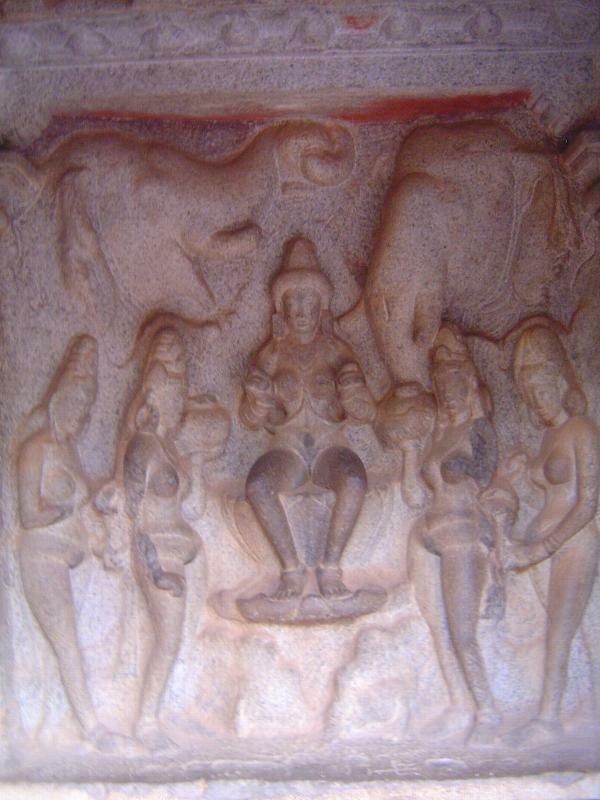 Another panel shows Vishnu's wife Lakshmi, here as Gajalakshmi, or Lakshmi with elephants. They bathe her. 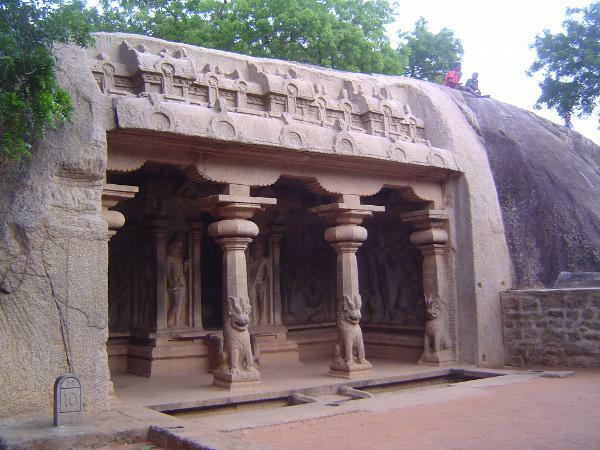 The Trimurti ("Three Forms") Cave Temple is unusual because it is one of only a few finished monuments. It's also unusual for lacking a mandapa or front porch. Instead, set forward a few feet, there's a central shrine dedicated to Shiva. It's flanked by two other shrines. On the right there's an image of Durga, minus a shrine. On the other hand, Durga stands impressively atop the severed head of the buffalo demon. 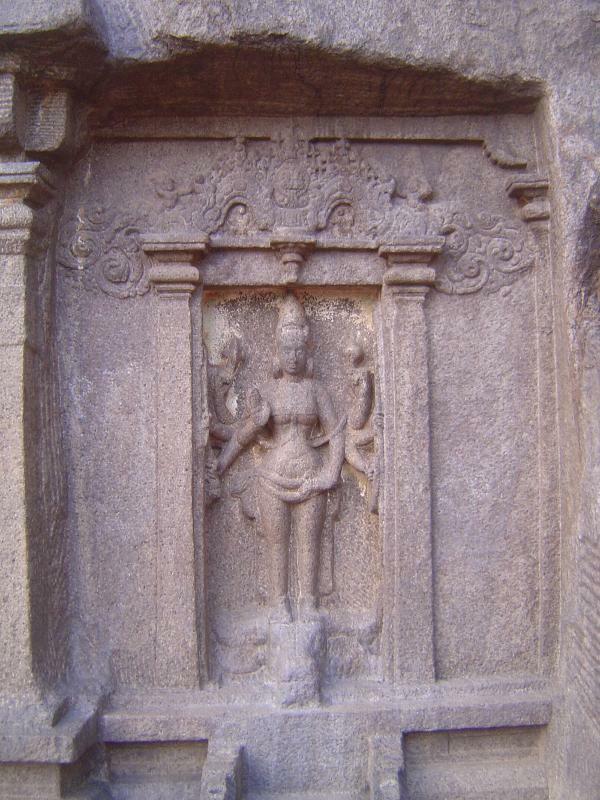 Above her is a makara torana, a gateway, that is, in the shape of a makara, or mythical serpent. The form is very widespread and, for example, is ubiquitous at Angkor. 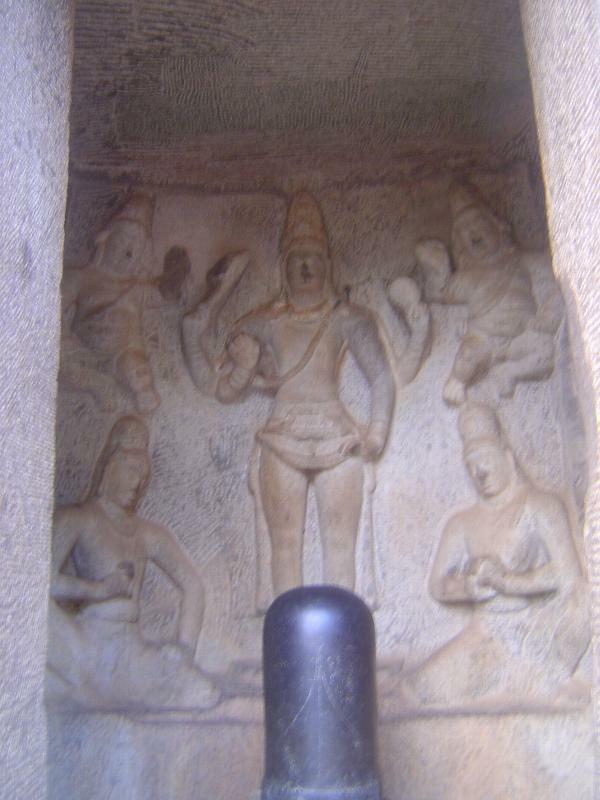 The lingam is a later addition to the central shrine, which also shows Shiva in human form. A side shrine is dedicated not to Brahma, as one might expect, but to Subrahmanya (otherwise known as Murugan), a locally very popular god of war and victory. The other side shrine is dedicated to Vishnu. 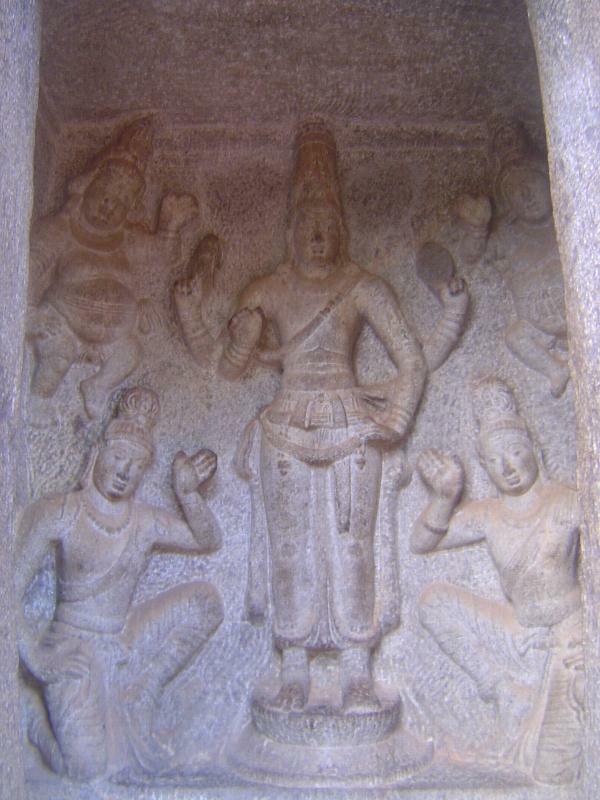 The Dharmaraja Mandapa is another trimurti or three-form temple, but it is incomplete. The only imagery is the outline of the door guards. 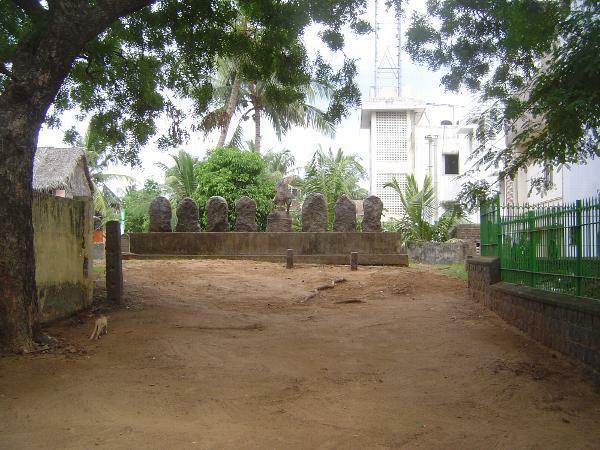 A similar case, the Kodi-k-kal Temple. At least the guards are intact. 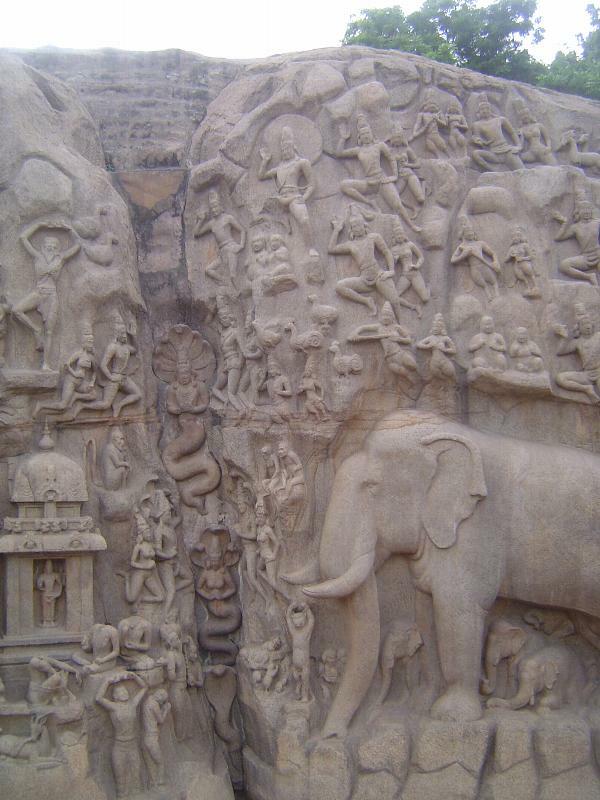 We arrive at last at the most well-known feature of Mamallapuram, the relief of Arjuna's Penance. 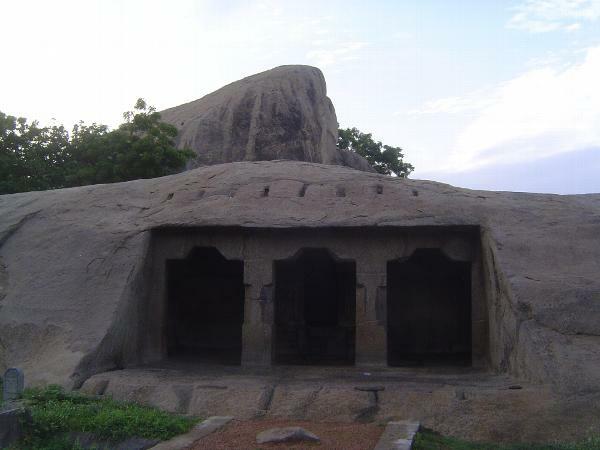 To its left is the unfinished Pancha-Pandava Cave Temple, which was planned to have a sanctum that could be circumambulated. 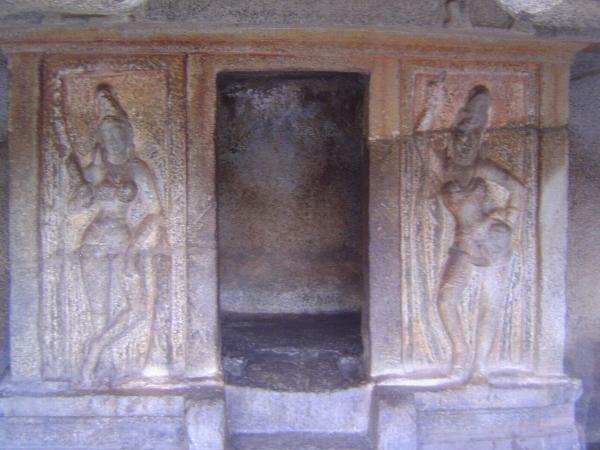 Before we get to Arjuna, here's the interior of that unfinished work. Scooping was done by carving out block after block. 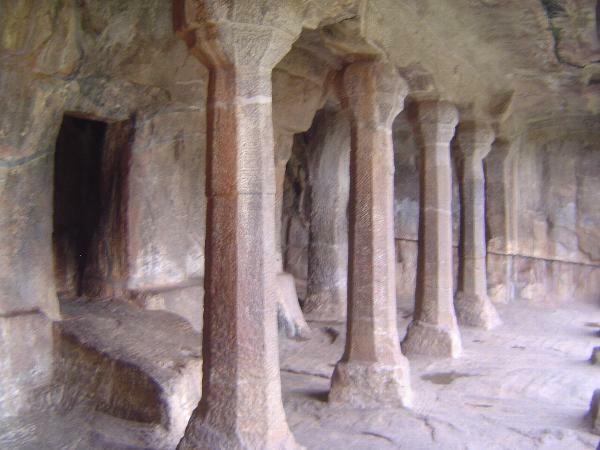 Here, near the Mahishasuramardini Cave, is another example of how a cave was scooped. Work had just been started when it was abandoned. Arjuna's Penance is an iconographer's picnic, even though it has nothing to do with Arjuna. 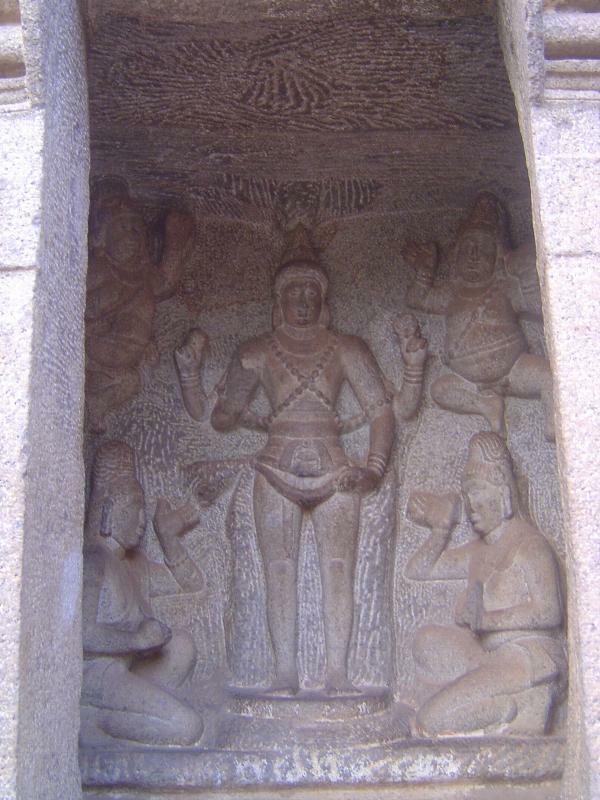 The central figures are Shiva, holding his trisula or mace-like trident and, before him on one leg, King Bhagiratha, doing penance. Why he's doing it is a long story, but it involves a holy man who several generations earlier had with an angry glance incinerated 60,000 young men, all sons of King Sagara, a predecessor of Bhagiratha. Since then, their ashes had lingered for lack of holy water to wash them away and to heaven. By his ascetic virtuosity, Bhagiratha had already won from the goddess Ganges a promise to return to earth, but her flood would wash everything away, so now the king is doing penance in the hopes that Shiva will help him. Shiva is about to do that, agreeing to break the fall of the water by letting it pour first over him, then over the earth. Meanwhile, everyone else in this drama seems to be ignoring both Bhagiratha and Shiva. Why, you ask? 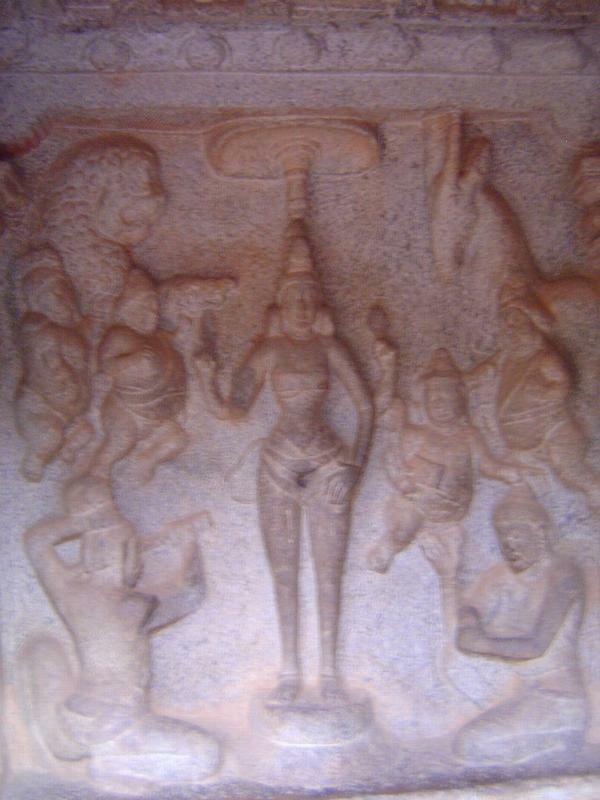 Before we get there, notice Chandra the moon, above Shiva, and the sun-god Surya with his disc or halo on the right. Down at the bottom, an ascetic worships at a Vishnu temple. He may just be Kapila, the sage who didn't like being disturbed by those 60,000 young men. Almost everyone is paying attention to the cleft in the rock, over which water could in fact, not myth, be released from a tank atop the rock. That water represented the Ganges, flowing as the result of Bhagiratha's penance and Shiva's boon. Directly in the path of the water, the naga or snake king enjoys getting wet; below him the snake queen does the same; below her, an ordinary naga gets wet. To the right of him, in a swipe at holy men who aren't so holy, a cat stands upright on one foot, while mice revere him before he pounces. 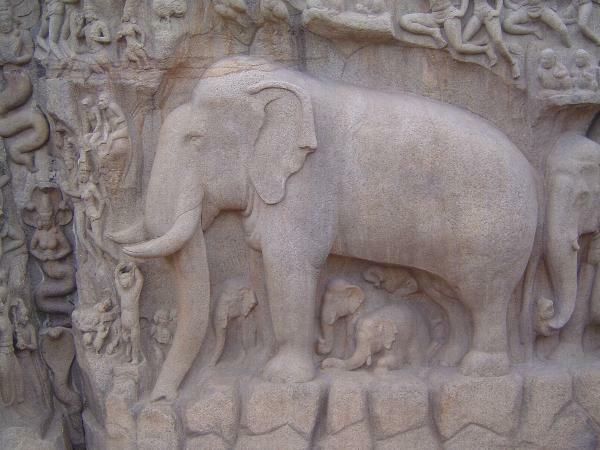 Lots of animals are attracted to the cascade, including an elephant and her young. 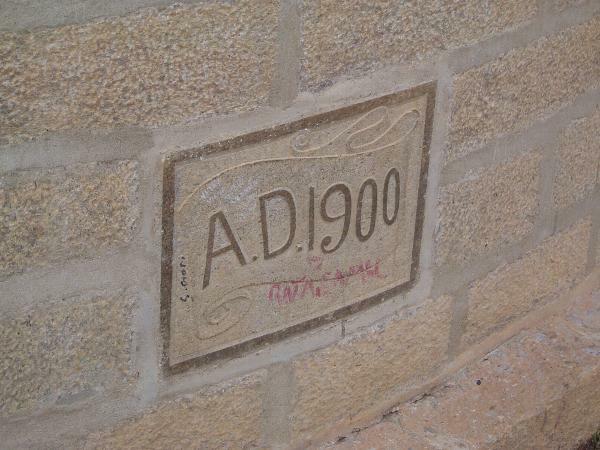 A few hundred yards to the south, there's another version of the same story. 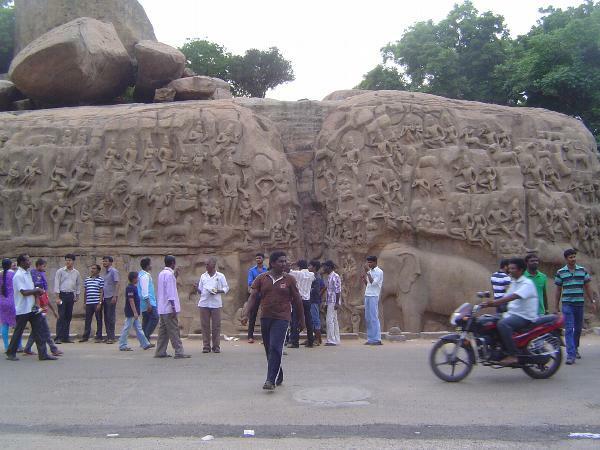 Shiva and Bhagiratha are on an exfoliating slab. To the right, there's another cleft, which is again the general focus of attention. In town, and unsigned, there's this fenced site, generally kept locked. It's called the Seven Mothers. They're freestanding sculptures made into a group. The largest, and the central figure, is Chamunda, who represents what time does to us all. Her earring ornament is a corpse; her necklace is human heads. The crescent curve at the corner of her mouth is one of her fangs. A pleasanter family tableau. near the Trimurti Temple. On top of the hill, this tank might have fed the artificial Ganges.